CRAZY COOL GROOVY!!! 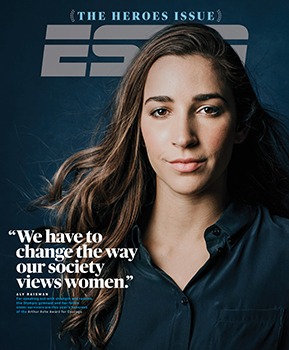 : ALY RAISMAN On HEROES ISSUE For ESPN MAG!!! Learn how Coach SCOTT BEIGEL SAVED So MANY LIVES, about 12 WOMEN Who WERE A PART Of The MOVEMENT That TOOK DOWN Dr. LARRY NASSAR, the team of ROYAL THAI NAVY SEALS Who Were A LIGHT In The DARKNESS, and so Much MORE as Team USA GOLD MEDAL OLYMPIC Gymnast ALY RAISMAN is the cover story for THE HEROES ISSUE of ESPN The MAGAZINE!!! Thank you @ESPN. I’m so honored and grateful.